In a few short years, Eve Mosher went from being an abstract sculptor who cared about the environment to an artist making powerful, engaging, and interactive public works about the climate crisis. Eve is an artist and interventionist living and working in New York City. Her work has been profiled in international media including the New York Times, ARTnews, L’uomo Vogue, and Le Monde. 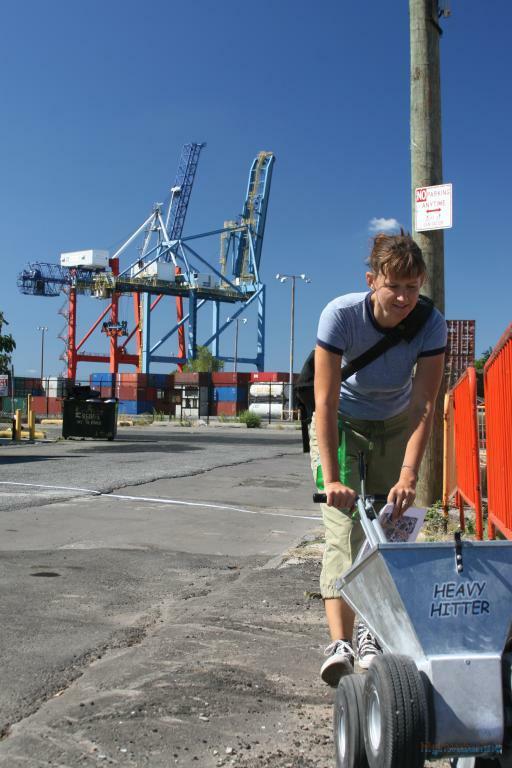 Her public and community based artworks have received grants from New York State Council on the Arts and New York Department of Cultural Affairs, both through the Brooklyn Arts Council and The City Parks Foundation. She has an undergraduate degree in architecture and a Masters in Fine Arts and is currently an assistant professor at Parsons the New School for Design and a consultant/leader for the Professional Development Program at Creative Capital. 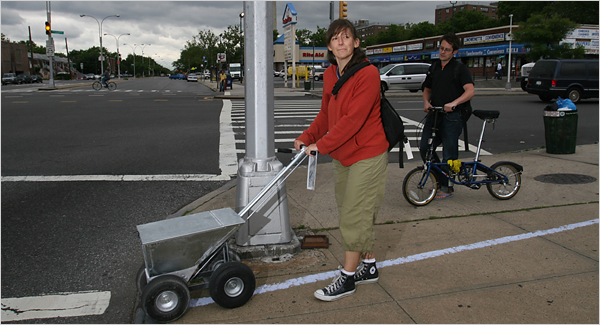 Eve Mosher: I guess the biggest, best-known project is the High Water Line Project where I marked the 10 foot above sea level line all around Brooklyn and Lower Manhattan over the course of six months. That ten foot line marks what is currently the one hundred year flood zone, and with climate change in the worst case scenario it’s going to be every four years, so it will be an uninhabitable area. It received a ton of media attention, but the point of the project was really to have these one on one conversations with people along the way about climate change and the effect it’s going to have on us New York City locally. S & S: Why were one on one conversations so important? EM: I started looking around at the work I was doing and the environmental organizations that I was working with and noticed we were sort of talking to the same people over and over again. Or the organizations were going out and giving lectures to people. I felt we needed to really have conversations and the most powerful way to make change happen was in a one on one conversation. So the project idea was to go out and to do something that would spark conversation. S&S: What sparked these conversations? EM: Walking around New York with a sports field marker. S & S: Why conversations? What is it that’s different about a conversation from a lecture? EM: When you’re dealing with some of these really complicated issues, for me it was finding out what people were interested in in their own lives. It’s not that lectures aren’t effective. They definitely are. I mean, I’ve taken away a lot from them. But I feel like when you’re dealing with these really complicated issues where people have wants and needs and different desires, and the issues themselves are really complicated, in conversation I can find out. I can elicit information from them and respond to it in a better way than in a large, lecture-type situation. S & S: So the feedback that they’re giving you, you can sort of tailor your response? EM: Yes, definitely, there’s a feedback loop happening. S & S: What kind of conversations did you have? EM: Well there’s a photo of me talking to two families on their way to the beach, Manhattan Beach on Coney Island, clearly they’re on their way for the day. We start talking about different things – I was talking about real simple things, and they were like, “Yeah, we already do that, we just do that and it saves us money, cause we don’t wanna run the air conditioner,” and they were realizing that they were already thinking in this way. I hand out a little packet of information, too—because they’re often asking, “what else can I do?” They were really interested in doing more when they realized it wasn’t that hard to begin with. I think in South Brooklyn and along the waterfront, they’re very aware of the precarious situation, primarily because insurance companies pulled the flood insurance from everybody in South Brooklyn—they did not do that in Manhattan, which is just as susceptible. So they’re all very aware of the dangers. It was really interesting to have conversations with people who were a little more informed than those “in the know” even. S & S: You could just knock on doors and talk to people one on one too, but you walked around drawing a giant line with sports chalk marker. Was their something important about the visual and performative qualities of how you were engaging people? EM: Why a public art project? I think for me knocking on doors is really confrontational, and with this sports marker thing—it was called “the Heavy Hitter,” we could just refer to it as that, the Heavy Hitter—they would come up to me and engage me in conversation, which implied that they had the time and the interest in having some kind of conversation. I did not go out and go, “Hey! You guys wanna come talk to me?” Or I didn’t advertise on my body what I was doing. I had initially wanted to make stencils that I would lay in the line, and then I started realizing that’s not actually what I wanted to do. It was really important to have people come up to me and ask what I was doing. Which of course limited the number of people that I talked to, but it was also self-selecting so I had, in a way I think, kind of higher quality conversations than if I’d been confrontational. There was one guy out on the Parkway in Bay Ridge and we had a little conversation, and his ending remark was, “We don’t get much of that around here.” And I was like, “Get much what?” And he said, “Art.” I was thinking; oh, well, there you go! S & S: OK, but it wasn’t all just a performance piece. I mean, you handed out packets of information, right? EM: Right. I wanted to extend the conversation. So I thought of it as ancillary, but people were eager for the information. It was amazing how much they wanted to know. That they felt like, yes, we understand our situation is bad, what can we do about it? And they weren’t necessarily inclined to go find out on their own, but given this opportunity, they wanted to know. The packet was basically postcards we designed to address different parts of your life on each card. So you could take one to work, you could hang one up in the house, you could send it with your kid to school to share. I was encouraging people to share that information. Each card had ten things you could do in your life that were from really easy to much more complicated things that you could take on to reduce your carbon footprint. And then there were also two postcards to send to (then) Governor Spitzer and Mayor Bloomberg. And one blank postcard, with information to look up your local representative. I didn’t say that they needed to write anything specific – they could totally disagree with climate change if they wanted to – the card said something like, “I have thoughts on climate change.” And then a blank space for them to write whatever they wanted. S & S: You say the project got a lot of mass media. Was that an important part of this project, in retrospect? EM: Yeah. Yeah, yeah. I mean, of course, somewhat for my own career goals, but also for the idea that it was a really ephemeral project. The chalk line in some high-traffic areas didn’t even last two hours, there were some streets where maybe it lasted two weeks or something, but it was an ephemeral project. But also to get the word out to the larger New York region because I wasn’t [physically] talking to everybody. I was only talking to people who were either living or working or visiting this coastline where I was and only on the day that I was, so it was important to kind of extend the reach through that. The issue is something really important to us locally so it was important to get outside of any art press – which it did very well. Actually the art press picked it up only much later. Through my website I was hoping to get the word out to a larger audience as well. I mapped the whole walk and added photos and stories from along the way so you can do the virtual walk yourself if you want to. S & S: So, did you learn any lessons about the efficacy of your project that you are applying to other work? EM: Yeah. The thing that frustrated me about that project was I felt like I was just providing information. And I wanted to provide real tools for effecting change. Not that I’m against providing information, I still do projects that are about visualizing or informational projects. But I wanted to include remediation and I’d seen all these other artists – like Jackie Brookner and Aviva Rahmani – for whom that was their art – the remediation. So the project I’m working on now is a green roof network. So you can get modular green roofs that are like two by four that are not super lightweight, but they’re cheaper than getting a whole green roof. S & S: Why not a whole green roof? It seems like that would have a larger effect. 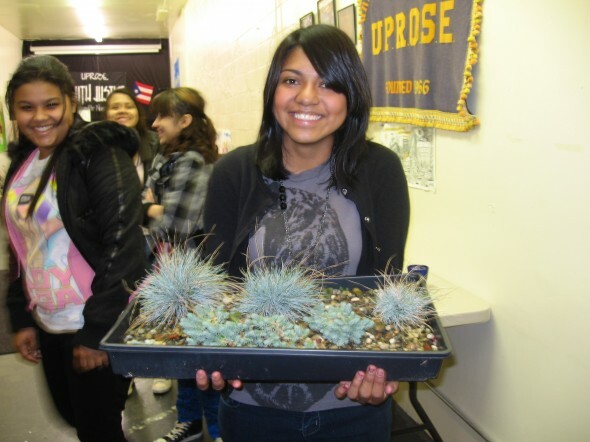 EM: The whole idea of green roofs is, for a lot of people, including me, really expensive. And you have to own a roof. So how do we as renters and people who don’t have a lot of money take part in something that could have a huge impact on New York City? The idea is to choose five underserved neighborhoods around New York City and go in and find two or three people, through the use of the community boards, who are interested in having this module put on their rooftop. Then I go in and have this little planting party. There we can talk about what green roofs are, what some of the urban environmental issues are that they specifically address, and about installing a roof module by module. So getting the ideas and information out again through these small conversations. And the people who want the green roof modules have to introduce me to two or three different people. It’s my Green Roof Pyramid Scheme. Then they’re building up within their community their own network of people who are interested in this kind of thing. The other aspect of the project that provides it more public access is all of the modules have flags and street level signage, so people can watch the visual growth of a network and might get involved in the project through the street level signage and become a recipient of the module through one of those. S & S: OK, that sounds like political activism and organizing, but what’s artistic about it? EM: Right, and I’ve had this conversation also with other friends of mine who do specifically environmental artwork, and I think because I come at it from an artistic point of view, that in and of itself—I’m not saying that’s my final answer—but that in and of itself makes it more of an artistic project. S & S: Can you talk about that a little? EM: I mean I do the research and everything, but for me it’s all about visual tools. They’re the tools I use. Now they are becoming blurred because activism and art are using so many similar tools. I’m also not lobbying for anything specific. I’m going just out to the people. And while I would love to have that conversation with city agencies, that’s not the purpose of the project. So is there a line between the two? I don’t know. It’s getting really blurry. I had a long email conversation between myself, two other artists, Brooke Singer and Xavier Cortada, and a representative from the nature conservancy. One of the questions the representative from the nature conservancy posed was how are artists different, in what we’re doing, from an organization? Brooke’s response was fabulous. She said that organizations are always needing long-term ways to build things up sustainably. We can be way more strategic and faster on our feet. And artists are more like, so I’m gonna go put those green roofs out and yeah I’m doing some test plots this year to make sure they survive, but beyond initially getting that project started, it becomes an open source thing. So I put it out online, I’m not required in it anymore, and people can create their own systems elsewhere. I’m not like an organization – or potentially activist – where I’m gonna sit and be concerned about overseeing that specific project over time. S & S: Can you talk a little bit about the open source model? EM: I’m setting my budget at 100 roof plots. So in five neighborhoods, that’s really only 20 roof plots, that’s not that many. 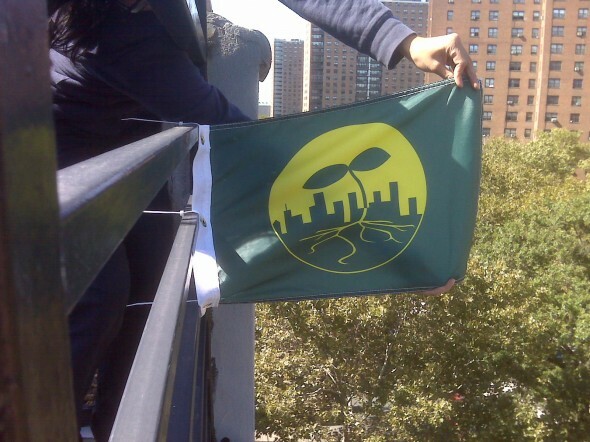 Beyond that, I’m setting up a relationship with the supplier of the green roof plots, and I’ll be providing access to the iconography used on the flags and the street level signage so people can print their own or I can tell them how I can get the flag. I don’t know if the flags will be free, but they can access them freely, and then all of the information surrounding the projects are available. The idea is that maybe someone in Sao Paulo will want to do this project, and then I will help them find their resources or give them the tools to find a local supplier of green roof materials, and then all the iconography and information that I’ve developed, all the online mapping tools for it will be available. Basically providing people in other areas access the information so they can re-create the project if they want. S & S: So how would you know if it’s effective? EM: Well what’s the actual effect on the environment? But effective in my mind is for people to connect within that community that’s been built. So if I’ve been working in Two Bridges, the neighborhood down near Chinatown, and I’ve got my two or three people and they connect me with three people, we have this group of nine, providing a method for communicating online, and encourage them to continue to work on these ideas developing either further green roof plots or meeting and developing other remediation projects. But the effectiveness in my mind is measured by how many green roof plots actually get out there. How much beyond those initial one hundred the project extends. S & S: Okay, so what’s the least effective thing you ever did? Or maybe you worked really, really hard, hoping it had some kind of effect and it fell flat. EM: High Water Line’s the first big public project that I did and I did that last year. Previously I was working in a really abstract manner and it was within the gallery system. That’s effective in a kind of emotional, connection to the art kind of way, but it’s not effective in moving people to think about things differently. EM: I was just gonna let that bomb drop and walk away. S & S: We’re not going to let you! EM: OK. My work before was this kind of abstract idea of man and the environment, and this real fluffy, fuzzy artistic aesthetic kind of idea. But I realized I want to make very specific, identifiable statements. I want to effect change. Because I was really pissed and nobody was doing anything about it, and basically our world was fucked, and we needed to do something. S & S: People have made an argument that those aesthetic, sort of “fluffy” as you say, art works touch people in a certain way that makes them next time they look at a nature, they think about it differently and so on and so forth. Why did you think: no! EM: Forget it! [laughter] Maybe those kind of things were happening! I mean, I still do gallery kind of work. I actually put up an installation recently that was just really decorative, and I think there’s value in that. But I don’t think the effect is as immediate, I think it’s more emotional and less actionable. There’s definitely work that’s made me think that things are really beautiful, but I don’t know that it specifically gives me the tools to change my world. You know? I can look at it and think, oh, that’s really gorgeous and I’m so moved, and that maple tree now, I’m gonna think differently about it. But it’s still in a poetic sense as opposed to an actual action. S & S: Is there a certain poetics in your more “actionable” work? EM: The chalk I used in the High Water Line I thought was beautiful. I made aesthetic decisions. I decided that I wanted to add pigment and make it blue, and to me this visual idea of drawing this line made perfect sense with the drawings that I do. And the work that I do was always really obsessive, and this work is really obsessive. So it moved out of the gallery space and it got really big. I don’t feel like I abandoned that realm entirely. I’m not giving up on the galleries entirely. There are still things that I’m working on that are object-based. And even the Green Roof thing, it is an object. And it is has visual aesthetics. S & S: Back to this idea of “actionable.” What sort of action do you want to come out of your work and how do you see that happening? EM: I had to explain this to someone who was with me, I think it was a city reporter or somebody who was like, “Are they gonna take that packet and make those changes right away?” And I’ve read somewhere that people have to hear about something like three times before they take action. So I’m one of those three people or statements. So I might be the first one, and they may not do anything. Or I might be the second one and they’re gonna think about it a little. Or I might be the third one, and I finally change someone’s mind. S & S: So you’ve changed someone’s mind, what do you hope happens then? EM: They will take on actions themselves. So they will start to consider within their daily lives what they impact with each decision that they make. EM: I hate that word, I hate that word. S & S: I know, we do too. But sometimes. EM: Sometimes it’s the only term.